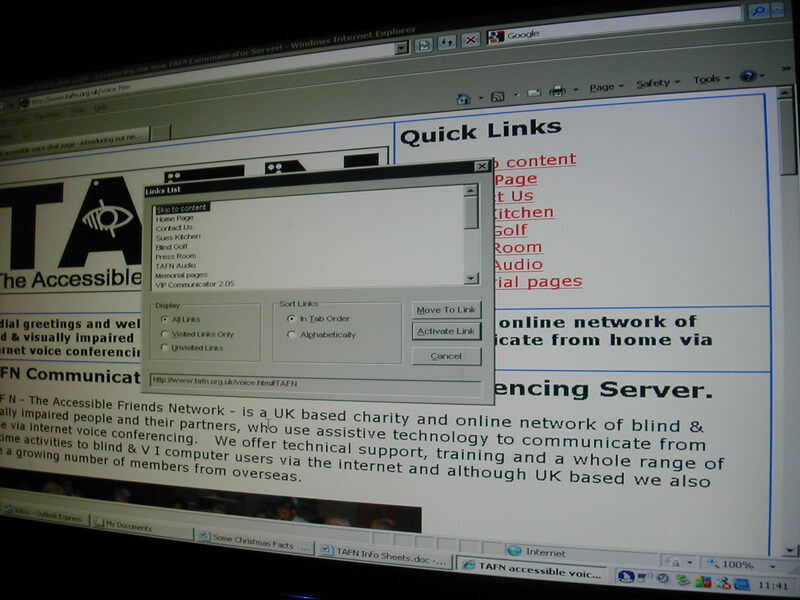 One of the questions we are often asked is “How do blind people use the computer”. We teach a lot of blind and visually impaired people including many older adults who lost their sight in later life, some of these used a computer when they were sighted. However, the majority of our learners have never used a computer and have no concept of what could be happening on the screen in front of them. Many people assume that all our blind learners must be using a braille keyboard – in fact figures show that fewer than 1% of the two million visually impaired people in the UK are users of Braille and even those who do use this medium will mostly be using a standard keyboard. A webpage accessed using a popular screen reader shows the list of links allowing the user to arrow up and down to select the link they want. The answer is screen readers or magnification software and sometimes a combination of both. The screen reader converts text to speech. When it is used on the web it can generate a list of available hyperlinks (see picture) and instead of using a mouse the user can press the keyboard arrows up and down to hear the title of the page before selecting the one they want to access. Many of our blind learners have gone on to write books, plays, obtain degrees and sometimes just have some fun! This entry was posted in Disability, Learners and tagged Blindness, Braille, screenreaders, Visual impairment. Bookmark the permalink. 4 Responses to But How Do They…. Hey Emilia – thanks for the link. Am looking forward to reading through stuff on your pages. Do you know if any studies have shown the reason why so few people use Braille? I think the RNIB may have more information on this topic than we would. My understanding is that as a general rule braille is unlikely to be taken up by people who have lost their sight later in life but I am aware of an article in the USA recently discussing a possible trend towards braille being increased as it enhanced people’s literacy levels – but unfortunately I can not put my hands on that article at present.